As the global downturn bites, Zambia’s copper industry is shedding thousands of jobs. It’s a bitter blow for workers who enjoyed a short boom after years of hardship but now fear destitution. In Kitwe, Chingola and Luanshya, the major towns in Zambia’s Copperbelt Province, miners are waking up to the shock of losing their jobs. An estimated 6,000 employees have been retrenched since November and more are being laid off every day. The Mine Workers Union of Zambia estimates 10,000 out of the country’s 23,000 registered miners will be out of work by the end of March. 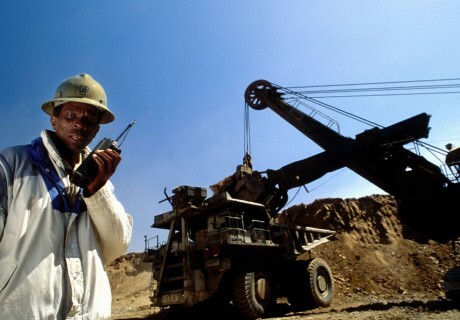 Many mining companies owned mainly by international investors have stalled their expansion programmes. Supporting industries such as transport, technical repair, engineering, and catering companies are feeling the strain. Some have already folded. Wellington Chibale has worked as a machine handler for Chambishi Metals in Luanshya, for the past ten years. He is married with six school-age children, and two dependants. Mr Chibale, who is 42, prides himself on being a dutiful husband and a responsible father. In the second half of 2008, when news of the drop in the price of copper began to circulate, the management held an emergency meeting. They asked miners to discuss cost-saving measures. To save jobs, they decided to cut administrative and operating costs and miners welcomed the decision. The mining companies insist the retrenchments are necessary, because of a drop in the price of copper on the world market and falling demand. Many mining companies have loans with international banks which have collapsed, cutting off their credit lines. Another Luanshya Copper Mines employee, Stanslous Mwape [not his real name], has worked as an artisan for the company for five years. He has children of his own as well as two orphans to look after. In his hand he has a list of people who owe money to banks; almost 2000 employees. “There are people who will only receive enough to survive for a month and yet the government is sitting back and doing nothing,” he says. When the mines were thriving, banks encouraged miners to take out loans for school fees, cars, and household goods and many grabbed the opportunity. Now their severance packages will be swallowed up by debt. George Mumba, the chairman for the Nkana branch of the Mine Workers Union of Zambia is critical of the redundancy packages on offer. “Most of the employees were given only one month’s notice which was not enough. They used to get a 28 month pay package now they are only getting a two-month pay package. If she cannot afford to pay off the bank loan she took out to start the business, she will have to sell up. It’s an echo of several years back when the then state-owned mining industry collapsed following a worldwide drop in demand for copper. Many Copperbelt towns became ghost towns. After years of stagnation, copper again became the country’s top foreign exchange earner. Between 2004 and 2007, the privatised mines and their supporting industries brought profits and jobs. Sales reached $1.124bn in the second quarter of 2008. During the boom, the government was unable to capitalise on mining royalties because it had signed up to restrictive privatisation agreements. As profits rolled in, the government came under pressure to collect more revenue. Today, as job losses mount, it has dropped its plans to impose a windfall tax which would have funded roads, schools and public services. The economic boom has gone bust in the face of Zambians. Economic consultant Professor Oliver Saasa believes the government could have anticipated the crisis. “Zambia is endowed with many natural resources but there hasn’t been a proper implementation of policies and no proper allocation of resources to these ventures,” he says. “As a result we find ourselves at the mercy of copper because it is our biggest foreign exchange earner. “For years we have known that it is necessary to diversify and not be heavily dependent on copper. We have water underground, arable land, other minerals, fresh water, fish, cattle, great tourism potential, industry is just waiting to be harnessed.